What do you think you'll be doing at age 67? 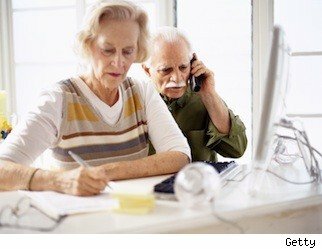 According to a survey by Sun Life Financial of a sampling of people aged 18 to 66, 49% of Americans believe they will be retired and not working at all; 24% think they'll work part time and 25% say they'll still be working full time when they hit 67, two years past the age most people have traditionally hung up the work boots. Why? The answer is simple, 80% said they don't expect to have enough money to retire. If you think this kind of talk is depressing, join the club. I like to work, but I don't want them to find me clutching my keyboard with my cold, dead hands. If you want to see how your attitude toward retirement stacks up against other people's, take SunLife's survey yourself. Then when you're done, use their income calculator to figure out how much money you spend now and how much you can expect to have to live on in retirement. Don't be surprised if the numbers are scary. If you come up short and don't expect to hit the lottery, here are four strategies to consider. Put off taking Social Security until you turn 70. Each year that you delay taking Social Security between 62, the first year that it's available to you, and age 70, when there's no more advantage to waiting, increases your check by 8%. Let's say you were entitled $750 per month at age 62. If you wait until age 70, you'll get $1,320 a month or $570 more. At 62, you'd be entitled to $9,000 a year; at 70, you'd get $15,840. That's enough to save you from an all-kibble diet. Here's a good analysis of the issue from investment firm Charles Schwab. Start a small business. It doesn't have to be Google to provide you with some income. Selling used golf balls on eBay could do the trick. Besides the income, the tax advantages can be very attractive. For instance, you may be able to provide yourself with health-care benefits, deducting the cost of them from what you're earning. A very nice reward for a little bit of work. Consider a reverse mortgage. One outcome of the financial crisis has been some rearranging of the rules surrounding reverse mortgages that makes more people able to qualify and in some cases the costs are less. If you still have lots of equity in your home, here's an outline of how the new program works. Think about sharing. Recent research finds that multigenerational households are on the rise and that sharing a home, a car and meals is a big economic -- and social -- boon after retirement.